Treasury Inflation-Protected Securities eked out a positive return in the 2012 fourth quarter, despite a slightly negative return on comparable maturity, straight coupon Treasury securities. TIPS outperformed straight Treasurys for the entire year and in three out of four quarters. In the 2012 fourth quarter, returns on straight Treasurys were slightly negative, but TIPS still managed to post a slightly positive return. The inflation accrual offset both the slight decline in TIPS prices and negative average yields. The chart below shows the TIPS yield curve at the end of 2011 and at the 2012 third and fourth quarters. 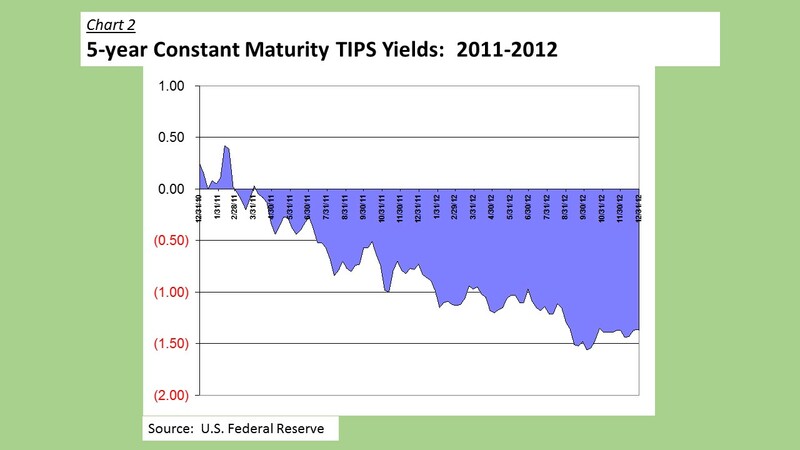 TIPS yields have fallen steadily over this 24-month period. Yields on short-maturity TIPS remain below -1%; but yields at the end of the year were less negative than at the end of the 2012 third quarter. Negative yields extend out to the 2032 maturity. At the beginning of the year, TIPS yields were negative out to the 2022 maturity. Demand for TIPS eased modestly in the fourth quarter. Prices fell on average by less than a point. Declining issues fell by 1/4 to nearly 3 points; while the only gainers were the three issues that mature after 2040. The gains on those three issues ranged from about 1/4 point to 1/2 point. In 2012, TIPS prices rose by about 3 1/2 points on average, with the shorter maturities down a little less than one point, medium-term maturities up about four points and the longer maturities up about seven points. TIPS yields were somewhat volatile in 2012. Yields on very short maturity TIPS fell sharply during the first quarter, presumably on concerns about inflation as the economy looked like it was heating up. They then rose (i.e. became much less negative) in the second quarter, as the economic growth outlook weakened. In the third quarter, yields have become more negative, even as fears of further economic weakening began to subside. But in the fourth quarter, TIPS yields rose modestly (again, became less negative), as the economic outlook brightened and yields on straight Treasurys also rose. On the long end of the maturity spectrum, TIPS yields rose briefly in the first quarter, but have fallen steadily since then. The average yield on the longer maturities turned negative in the third quarter for the first time and remained negative in the fourth quarter. The yield on five year TIPS ended 2012 at -1.37%, 64 basis points lower than than the -0.73% yield that they carried at the beginning of the year. 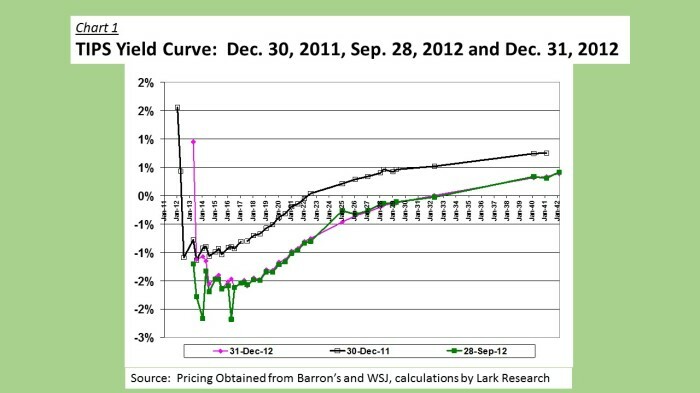 Five-year constant maturity TIPS yields bottomed at -1.62% on October 4, 2012. 10-year TIPS yields fell steadily throughout the year, but have flattened out recently. They declined from -0.05% at the end of beginning of the year to -0.67% at the end of the year. Total returns were better on short- and medium-term TIPS in the 2012 first quarter. Yields on short-term TIPS were decidedly negative, indicating that investors craved their relative safety and protection from inflation. Average breakeven spreads of 267 basis points on short-term TIPS implied that inflation expectations were modestly higher in the near-term, but the differences in spreads between short-, medium- and long-term TIPS were still relatively small. In the second quarter, short-term TIPS produced negative returns, as their yields rose by nearly 200 basis points from -2.32% to -0.39%. On the long-end, TIPS earned a 7.5% total return, as average yields fell from 0.54% to 0.16%, Breakeven spreads declined markedly from 2.40% on average in the first quarter to 1.59% in the second quarter, due primarily to the sharp drop in straight Treasury yields. Spreads declined most on the short end of the yield curve, signaling that inflation became less of a concern. The performance of straight Treasurys mirrored that of TIPS, with the greatest gains coming in the longer maturities. In the third quarter, the total return on TIPS averaged 2.2%, which was not nearly as high as the second quarter, but still quite good nevertheless. Returns were highest in the longer maturities, which earned 3.4% on average. Straight Treasury returns were positive at 0.6% in the third quarter, but much lower than the second quarter’s 3.8%, as yields bottomed out. The average yield on TIPS declined from -0.46% to -1.08%, while straight Treasury yields eased from 1.13% to 1.08%. As a result of the steeper drop in TIPS yields, the breakeven spread widened from 1.59% to 2.16%. 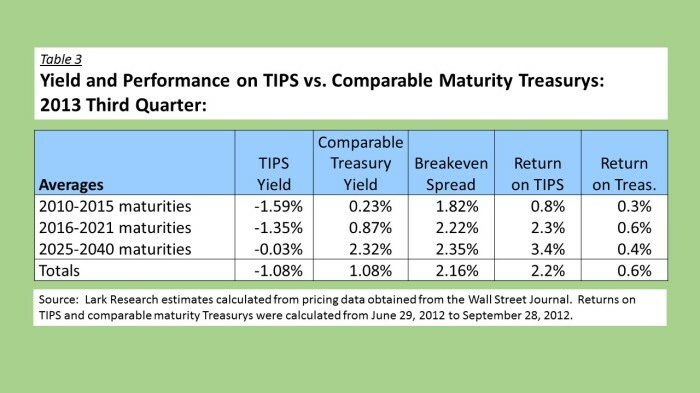 In the fourth quarter, TIPS returns averaged 0.4%, better than the -0.2% return on straight Treasurys. Although the average price for TIPS declined slightly and yields for nearly all TIPS issues, except for the longest maturities, were negative, the inflation adjustment kept total returns in positive territory. In contrast, returns on comparable maturity Treasury securities were flat in the short- and medium-term maturities, but negative in the longer maturities. 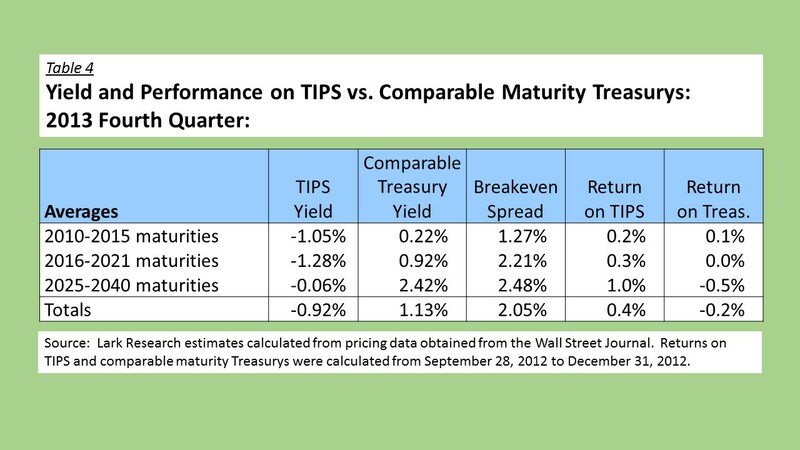 On average, yields on TIPS rose 16 basis points to -0.92% (compared with Q3), while yields on comparable maturity Treasurys rose 5 basis points to 1.13%. As a result, the average breakeven spread narrowed by 11 basis to 205 basis points. For the full year, TIPS earned a total return of just under 6%, better than the 2.4% return on straight Treasurys. Average TIPS yields declined to -0.84% from -0.06% at the beginning of the year. Likewise, average straight Treasury yields for comparable maturities declined from 1.80% to 1.21%. As a result, the breakeven spread widened from 184 basis points to 205 basis points. 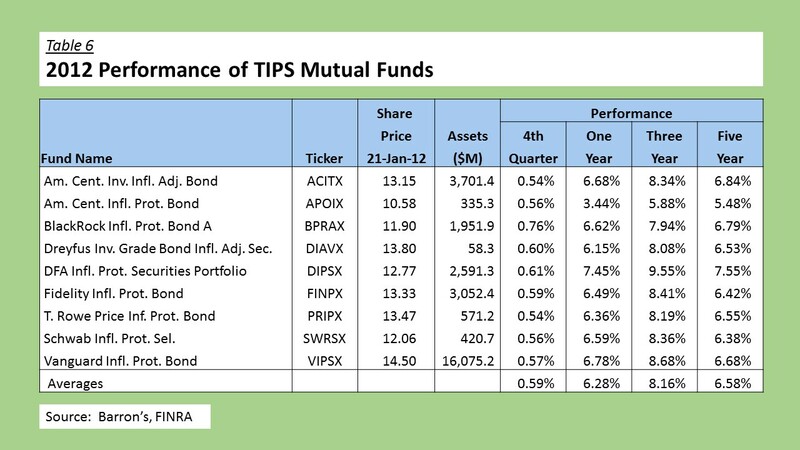 The performance of TIPS mutual funds exceeded the average returns from individual securities. The average TIPS mutual fund in this sample earned 0.59% in the fourth quarter, modestly above the average return of 0.42% calculated for all TIPS securities. Differences in performance among TIPS mutual funds probably relate to differences in average duration. Those funds more heavily exposed to the long end of the yield curve should have earned higher returns in the quarter.